Both legacy and more recently introduced organic chemicals can be found in Arctic marine foodstuffs. Much of the contamination is due to long-range transport. Climate change will affect pathways and mobility of contaminants in Arctic snow and ice. Effects of a changing climate on contaminant levels in Arctic ecosystems will depend on how climate change exerts its greatest effect. A number of contaminants are present the Arctic environment even though they have never been used or emitted there. The main pathway of persistent substances from source areas in e.g. Europe is via atmospheric transport and deposition. Another transport pathway of contaminants to Arctic is via the ocean currents. Long-term monitoring of POPs in the air is conducted in Scandinavia and in Arctic and data from these measurements have been used in ArcRisk. Some of these data sets allow assessment of temporal trends of atmospheric concentrations. Environmental monitoring of concentrations of contaminants over time in different environmental matrices are a powerful tool to elucidate changes and trends of POP concentrations. Snow is a significant source of atmospherically derived contaminants of POPs to the terrestrial environment of the Arctic. However, there are relatively few studies of emerging substances such as PFAS and flame retardants. One study within the ArcRisk project investigated PFAS in the snowpack in northern Sweden and Norway. Inventories of PCBs in Arctic surface seawater of the pan-Arctic shelf seas estimated the amounts of PCBs to be in the order of 100 kg each. The PCB congener ‘fingerprint’ for each of the seven shelf seas and the interior basins, showed differences between the eastern (Pacific sector) and western (Atlantic) regions suggesting different source regions and/or transport pathways (Carrizo and Gustavsson, 2011). An investigation (based on field observations ) of the PCB contribution from the six major rivers in the coastal Arctic seas showed that the river fluxes are likely a significant vector for delivery of PCBs to the Arctic Ocean (Carrizo and Gustavsson, 2011). The fate of pesticides entering the ocean from melt water runoffs was assessed using passive- water and air samplers in Godthåbsfjord, Greenland (Carlsson et al., 2012). Chlordanes were found to have higher potential than more volatile contaminants (e.g. α-HCH and HCB) to act as tracers for melt water runoff into an Arctic fjord. Glaciers and meltwater from snow caps are potential sources of contaminants to the receiving fjords and lakes. Main focus has been on the marine food web, since it represents the most common food source and main exposure route regarding POPs for humans around the Arctic. POPs in Greenlandic food items (raw/smoked salmon, smoked halibut, seal and whale beef, narwhal mattak) were analysed (Carlsson et al., 2013, 2014), and the concentrations were relatively low. PFAS was not detected in the fish samples, most likely due to industrial processing of the fish, e.g. washing and cleaning of the fillets. 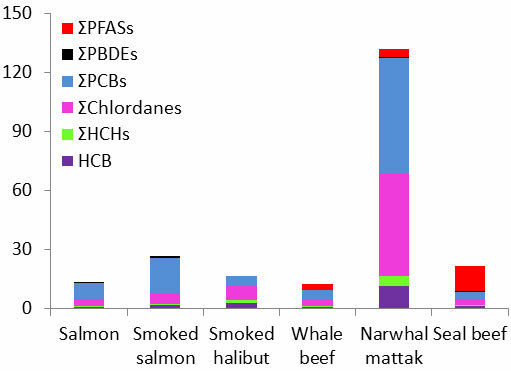 Narwhal mattak (the local delicacy of skin and blubber from the narwhal) contained highest concentrations of the pesticides, PCBs and PBDEs analysed, while seal beef contained highest concentrations of PFAS, see diagram below. To assess selective transformation processes in these animals, enantiomeric selective analyses were performed for the chiral pesticides α-HCH, and trans-, cis- and oxychlordane. There was a difference between fish and mammals regarding α-HCH. This indicates that different uptake and/or transformation mechanisms were responsible for the non-racemic (un-even distribution of the enantiomers – the different types of the molecule) distributions in the analysed mammal and fish species. The seal samples were mostly racemic (even distribution of the enantiomers) for all pesticides, while the narwhal showed non-racemic enantiomeric fractions for all chiral pesticides analysed. There were no general enantiomer selective transformation/ accumulation trends found for chlordanes. This indicates that the enantiomer specific properties are an important prerequisite for the interaction of the chiral contaminant with internal metabolic processes. Median concentrations (ng/g ww) of the POPs analysed in the Greenlandic food items. 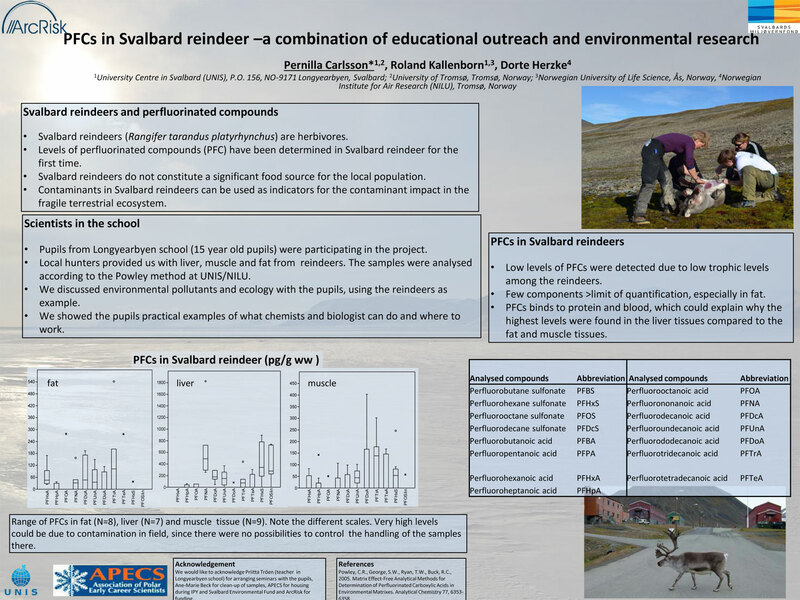 Svalbard reindeers were analysed for PFAS, see poster below. Levels of PFAS were low, due to the low trophic level of reindeers and low exposure in a terrestrial environment compared to the marine environment.